A circular walk past the Sea Pool to Crooklets beach and along Maer cliff to the beach at Northcott Mouth where the shipwreck of the SS Belem is exposed at low tide. A circular walk from Widemouth Bay along the Coast Path though the Phillips Point nature reserve to The Storm Tower at Compass Point and then along the Bude Canal to Whalesborough, returning across the fields to Widemouth. A circular walk through Woodland Trust reserves of the ancient Millook woods, meadows to the former smuggling den and 1920s wild party venue of Trebarfoote, and along the coast from Cancleave Strand to Millook Haven where colliding continents have melted and folded the rocks like toffee. A circular walk from Sandymouth beach, via the Landmark Trust's historic buildings of Coombe and a derelict mill which is one of the largest bat colonies in England, to the remains of the once great manor of Stowe Barton, the interior furnishings of which can be seen in Prideaux Place at Padstow. A circular walk through Bude and along two miles of sandy beaches to Sandymouth, passing Bude Castle, built on floating foundations by the inventor of limelight, the Victorian Sea Pool, the Half-Tide Cross and the shipwreck of the SS Belem from which the propeller shaft supports the barrel on Barrel Rock. A circular walk through the Millook woodland reserves to the ancient gnarled oak forest of The Dizzard, returning along the coast with panoramic views to Hartland Point, to the chevron-folded cliffs and honeycomb reefs of Millook Haven. A circular walk though the wildflowers of the Kilkhampton Common nature reserve and woods of the Coombe Valley, returning via the remains of the Norman castle at Penstowe which consisted of a stone tower perched on the top of a steep hill but surrounded by two baileys, rather than the usual one, the reason for which is a mystery. A circular walk from Poundstock through bluebell woods along the river to the pretty pebbles and chevron-folded cliffs of Millook Haven and along the coast path with panoramic views from Bridwill Point. A circular walk from Vicarage Cliff along the coast path to Marsland Mouth at the Devon border, returning through fields to Morwenstow rectory, church and the Rectory Tea Rooms - the last stand of the Cornish cream tea before the Devon border. A one-way coastal walk, made circular via an initial bus journey, along the Shipwreck Coast from Crackington Haven to Widemouth Bay passing the bluebell woodland of ancient twisted oaks at The Dizzard, chevron folded rocks and honeycomb reefs of Millook Haven and fossil beds of Wanson Mouth. For a walk starting from Bude, there's Bude to Sandymouth. 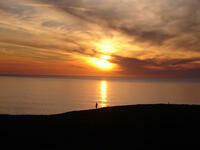 For a walk which visits Bude part-way round, try Widemouth to Bude.